As updated in my earlier post, Nifty has faced its first major resistance after successfully piercing the 10000 mark. Watching the last Nifty pattern I suggested that Nifty can come down till 9650-9450. Out of my 2 targets, Nifty has already made my first target by making a low of 9685.55 on last Friday. But I also mentioned that this target will not be achieved so easily. RSI 2 strategy suggests that there will be some dead cat bounce before making fresh lows. I will discuss how to play this dead cat bounce now. What Is RSI 2 Strategy? RSI 2 strategy has been discovered by Larry Connors. As per this strategy find a stock or index well above 200-day moving average. Now if the daily 2-period RSI drops below 5 open up a buy order. Exit the long trade if daily 2-period RSI crosses above 60 or 70. Short Selling Rules As Per RSI 2 Strategy? For short selling find a stock or index well below 200-day moving average. Now if the daily 2-period RSI rises above 95 open up a short sell order. Exit the short trade if daily 2-period RSI crosses below 40 or 30. Some tweaks on the RSI 2 strategy has been done by me. I have seen that best results are met when RSI crosses below 2 OR above 98 because those are extreme market conditions and the market is highly overbought or oversold. On last Friday Nifty has closed at 9710.80. The daily 2-period RSI has closed at 1.04851. So it’s well below 2 and market is highly oversold. On Monday morning open up a buy order on Nifty future OR Nifty August 9700 call option. If the RSI 2 closes further below you can add to your Nifty future long OR Nifty August 9700 call option. 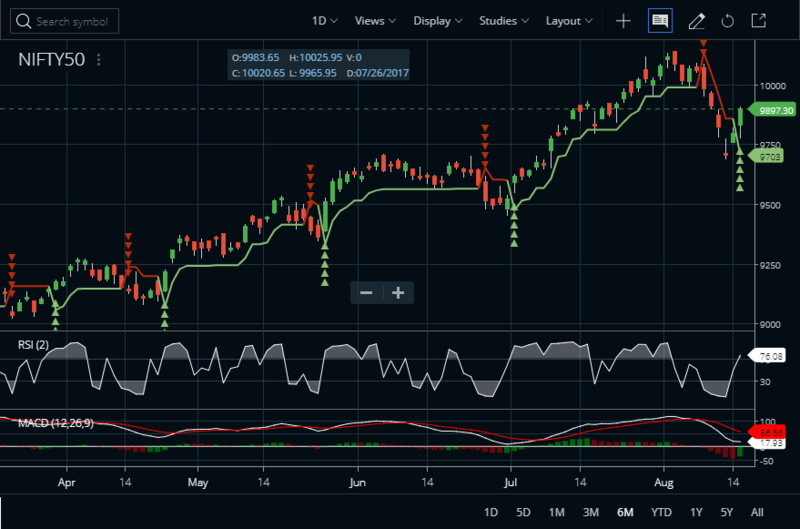 You need to follow the 2-period RSI of Nifty in daily charts on your favourite charting platform and mark an exit as soon as the 2-period RSI crosses back above 60 or 70. I have used Amibroker for my Nifty index chart but you can watch Nifty end of day charts on Zerodha Kite. Remember this is a positional trading strategy and you need to exit position on the end of the day when 2-period RSI crosses above 60 or 70, so no need to watch the charts whole day, just check the daily charts around 3:15 PM and take your exit decision. I will also add my exit update on this post. Wish you a very happy independence day in advance and loads of profits this independence day. Exit Update: At market close on 16th August I am seeing the daily 2-period RSI on Nifty index is 76.08. Nifty has closed at 9897.30. Check the above image. So we are booking profits. Its a 187 points gain in only 2 days holding. This is the power of RSI 2 Strategy. Update For Short Sellers: A bounce is due, so you can short Nifty again once this bounce if over. Suri at my end 2-period RSI is close to 40 now as the market has already taken a bounce as expected. For next long entries please buy around 3:15 PM – 3:30 PM when you see daily RSI 2 is below 2. The stock/index should be well above 200-day moving average. Sir, as per this strategy bank nifty aug future RSI is around 2.5. Can we intiate trade in this? I feel your readings are wrong. I am getting Bank Nifty spot daily 2-period RSI value as 43.61.